If DC and high frequency (>2,000Hz) PWM driven constant current LED solutions produce no visible flicker, why consider a source with greater flicker presence? In all of the discussions on this topic, comprising hundreds of hours, reading of research papers, articles in magazines, and marketing materials, it all comes down to one simple and baser answer. Supposedly, AC driven LED products are cheaper than those with current control drivers. In other words, there is no potential to improve light quality, no opportunity to advance visual performance, and no value in deploying alternating current driven LED products, other than to reduce first product costs. While there may be a small benefit in having a source without a driver attached, for space reasons within a product design, this is a relatively small portion of market need. That said, a high voltage DC system configuration can be employed to produce a similar benefit with reduced cost, and no flicker, so any benefit of direct line power driving of an LED system is rendered moot. While there has been statements that elimination of certain components, such as capacitors, increases reliability of AC driven LED products, the rated life of the modulating products available on the market today are less than those expected from DC products, including driver components, so that case seems also to be foundation-less. My first 52 in 52 product utilized AC powered LEDs and is still in use today on a daily basis. In my personal experience, adopting AC LED products, and my previous discussion of this topic as it related to the Seoul Semiconductor Acriche LED that I applied in my office, I have attempted not only to explore the topic in objective terms, but live with the products and evaluate them over time in subjective terms. I have several AC LED products in use around me, including task lighting, and room lighting in both direct and indirect forms. The two task lights we use regularly were included as Design One and Design Five in the 52 in 52 series in 2010, and remain in use today. The direct lighting products were covered in the Seoul Acriche article mentioned here (no longer being used, for reasons I will explore in a moment), and Design 37 in the 52 in 52 series, which remains in service today as well. 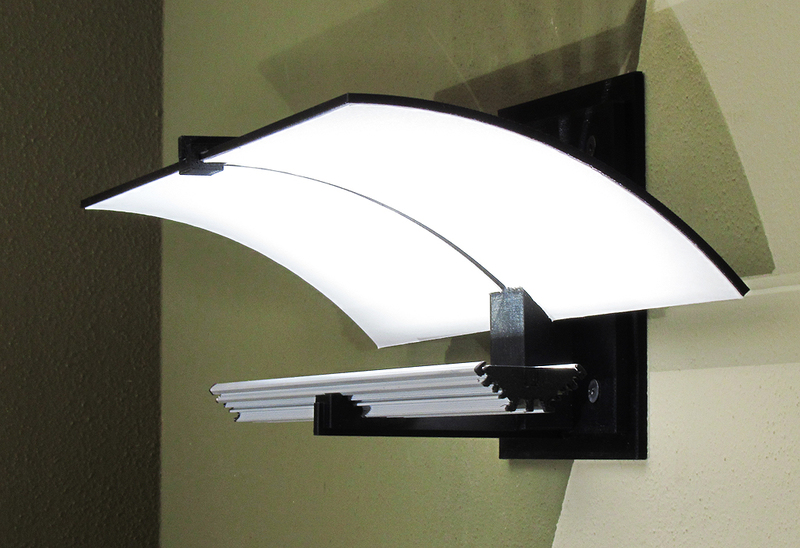 This wall sconce remains in service today, also employing AC LEDs. In addition to employing AC LEDs in my own spaces, we have also applied them in large scale application to evaluate them long term as alternatives to DC systems. One such application was described here in the head-to-head comparison with a CFL residential application. In that installation, now several years old and still operating, the results were strong, and the cost savings real enough to create more interest in the application of this approach. 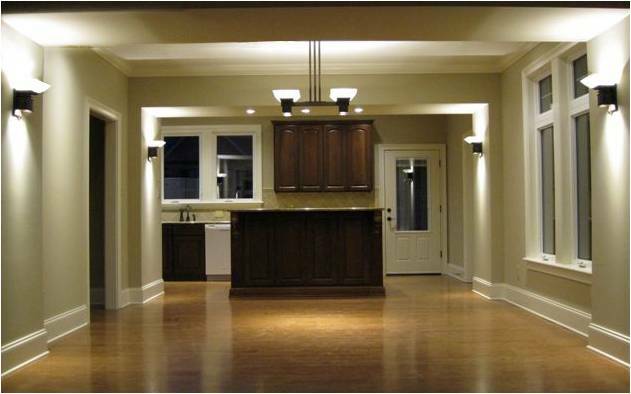 Applying LEDs in efficient lighting designs is no more complex than use of any other source, just more productive. In all of these applications, control of flicker was not applied to any degree, so it existed without question. 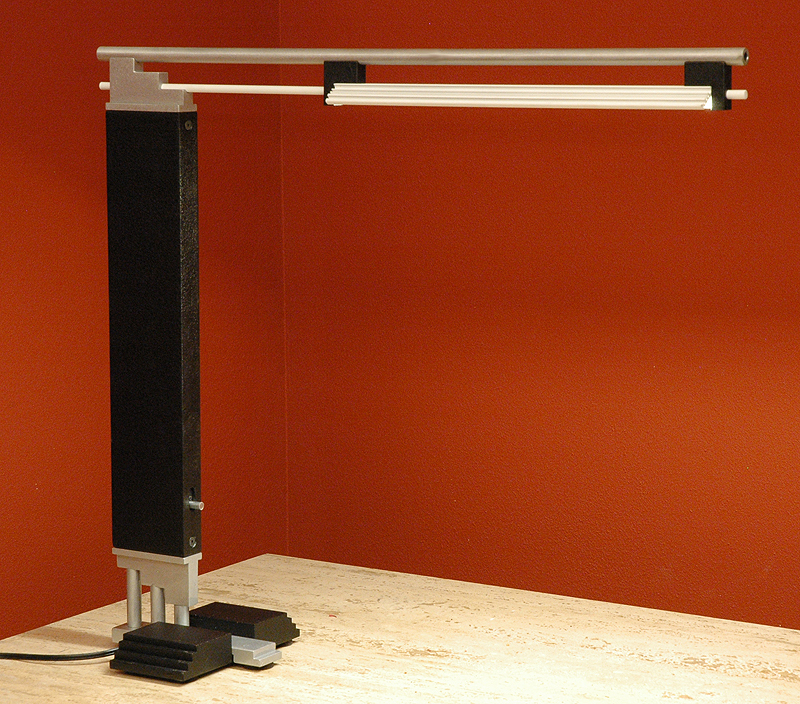 I find that under the mid-level task light use for non-critical tasks, there is no significant issue. In the indirect sconce application, I find no issue either. However, under office lighting conditions, where I work every day for hours on end, mixed with other light sources… I found the presence of flicker annoying and troublesome. I found issues of eye tiredness, eye strain, and difficulty reading and seeing small objects and text. In an effort to resolve this, and to determine whether the AC modulation was indeed the issue, I replaced it with a new fixture with DC driven LEDs. The improvement was immediately noticeable, and caused me to re-think their use, and raised questions as to whether there was a valid position to take in favor of them in any application. 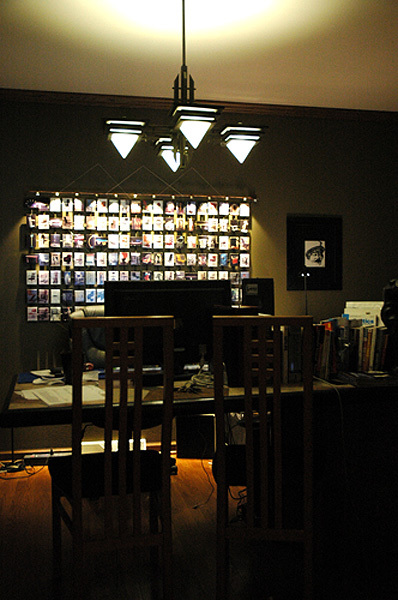 This is my first application of AC LED in application – for office ambient illumination, allowing me to live with it for long periods of time, over many years. Not all DC LED drivers or supposed DC LED products solve the problem. In fact, I have tested several products, from drivers to replacement lamps. There are numerous supposed “DC” LED products on the market that generate just as much flicker as AC LED products, I have one that is worse. This is prevalent in cheap retrofit lamp products where space inside the bulb shape and costs are driving engineers to short cut true DC current control approaches, delivering flickering end products. Many of these are appalling performers when put on dimmers, both in aggravated flicker presence, but also in creation of dimmer noise and eventual failure – not to mention very limited dimming range – even among those who claim to offer a “dimmable” product. While in the early stages of this exploration, the cost differential between an AC and DC system were real, today the cost of drivers and their scale, has made this argument finite at best. The cost of a 4W AC line voltage LED with no flicker mitigation at all, delivering 180 lumens is now $18. The cost of a 4W AC LED product with moderate mitigation delivering 200 lumens included is around $20. These are no great performers at 50 lm/W. Low voltage AC LED solutions cost about the same, and require the addition of a voltage converter, which costs about the same as a current DC driver delivering the same result in efficacy (40-75 lm/W transformer loss included). None of these are dimmable using 0-10V and are limited in range when put on line voltage dimmers. Meanwhile, I am now purchasing DC drivers that are compact in size, delivering up to 1A of current, dimmable with 0-10V, or line voltage for less than $14.00. These, coupled to a new generation COB Array deliveirng 1100 lumens, at 120 lm/W, for $4.60, with integrated connector (no soldering required), puts the system cost at $18.60. The AC solutions run around $0.09 per lumen delivered, while the DC solution delivers double the efficacy and 6 times the light, at $0.017 per lumen, or less than 19% of the AC solution. At this point, I lost interest in considering AC sources and approaches in any application, other than those rare instances where I simply have no place for the driver to go, where line voltage connection is present. This generally excludes low-voltage approaches, as if I have room for a transformer, I can find a driver with similar dimensions to take its place, so will utilize a DC product with greater service life, higher efficacy, and lower cost per lumen. In the end, the number of instances I can see supporting line voltage AC LED application is very limited. Service life is another area where properly designed DC systems outperform AC products. Interestingly, the tests for LED lumen depreciation under LM-80 procedures, does not include AC over/under voltage cycling an AC circuit subjects the LEDs to. This raises an interesting question of what standard can be used to derive lumen depreciated life from for these sources. If DC and high frequency (>2,000Hz) PWM driven constant current LED solutions produce no visible flicker, with higher efficacy at a similar composite cost, why consider a source with greater flicker presence? The answer, at least for me now, is that there is no reason to accept flickering sources of any type for any other reason but cost saving and space limitations, which appears to be limited to only those instances where the product envelope cannot accommodate a DC driver, that are also cost sensitive. since in cases where a driver can be included, a higher efficacy DC solution can be created. In this, the costs are defined only by first cost, since the lumen efficacy is lower. This limits to the use of line-voltage sources or retrofitting of existing low voltage products, where replacement of the transformer with a proper driver, or including a driver in the retrofit product operating from the existing low voltage source is prohibitive. This is a very narrow definition and market space, but it does exist. While I am not highly sensitive to flicker in general, I feel that the research on the topic regarding visual acuity and the effects of flicker in the 100 to 120Hz range, with flicker % of more than 35%, and a flicker index in the range of the old T12 fluorescent on magnetic ballasts, is sound and reasonable. Other research indicates that frequencies, regardless of My personal experience living under the two is consistent with those findings, so I have not reason to doubt them. I have seen flicker mitigating products that create excellent results in both cutting flicker% and improving the flicker index to levels that would be of no concern. Unfortunately, none are headed to market any time soon, and the costs involved were higher than a more conventional AC/DC converted current controlled driver approach. The one area where AC LED solutions offers some avoidance of the obsolescence cycle the DC LED’s most aggravating dynamic at this time. The cycle above is a real-world summary from an actual customer experience. In concluding this, I will state that designing product around the current range of DC drivers, and the variability in voltage/current characteristics of LEDs, as the LED producers hunt and peck their way through planned obsolescence cycles to seek some perfect nirvana of proprietary control over a corner of the market is extremely frustrating. This makes AC line voltage and fixed 12V or 24V LED solutions very attractive, and may cause some to set aside any concern over flicker to avoid the circus that LED product manufacturers and packagers have made of the main LED market space. The cost of chasing their marketing games, for fixture manufacturers, in re-doing tests, UL listings, inventory losses, delivery delays to customers, and engineering time and effort is unacceptable in the long term. At some point this will settle down (I hope) which will squeeze the AC approach into a narrower portion of the market than it already occupies. As of 2018, the AC LED products on offer fall into two camps. 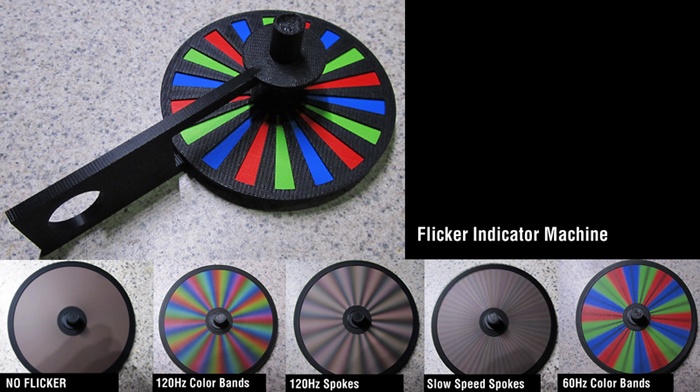 Those with no flicker mitigation and those with on-board components to reduce or even eliminate flicker altogether. However, the one thing they both share, and share with DC LED technology, is that they are now as much a moving target as DC LEDs. 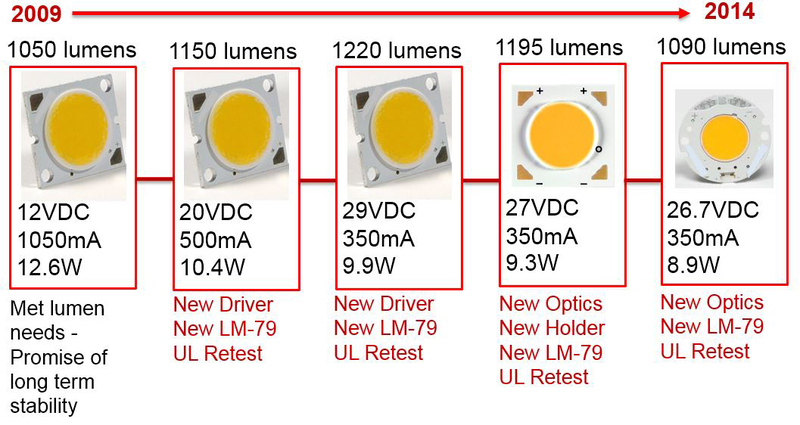 Select one that works today, and it is just as likely to be gone in a year as any other LED, or updated to the point that there will need to be significant product updates to follow, including UL listing issues, optics, dimming compatibility, etc.. In other words, the better AC LEDs get, the more they inherent the liabilities of DC LED technology. I am not convinced there is a need to operate LEDs on line voltage. I believe a smarter and far more robust approach is to redress the use of distributed line voltage for lighting. With this, it is easy to see a future where lighting is connected via a distributed low voltage infrastructure. Whether that is 48V, 24V, PoE, or other, has yet to be determined. What is clear, is that should that be the case, distribution of low voltage DC will end the need to consider light sources operating from 50Hz and 60Hz high power, which will end the entire debate about LED flicker… with one significant exception – outdoor area and roadway lighting. In outdoor area and roadway application, distribution of low voltage DC is not practical. Voltage drop is a significant issue there. However, as the industry is transformed to support a low voltage grid elsewhere, it is very unlikely that the outdoor segment will attempt to power LEDs directly from mains voltage, over simply utilizing AC/DC constant current drivers to power LEDs designed to operate at lower voltage on DC circuits. With DC powered LEDs connected to high efficiency drivers delivering 150+ lumens/watt, against AC LEDs struggling to attain much more than 75lm/W, the case for AC LED has become even less strong. Further, with drivers now available in very compact forms, the case for using AC LEDs is weakened further. Finally, and this will likely be a significant issue into the future, the digitalization of building automation, the IoT, demand for dim to zero, etc… all weight against simple line voltage connected devices operating LEDs directly from line voltage power. At this time, coupling the energy efficiency loss, issues of flicker, poor dimming characteristics, and costs involved, I cannot serious make the case for their existence. Going forward, as we move toward connected lighting, advanced building automation, lighting itself will become more and more a DC universe at its core. Further, as human factors considerations grow in priority, the acceptance of any source that flickers will be reduced to zero. This all leads to line voltage AC power to all but the largest and furthest luminaires becoming as much a relic of the past as the use of resistance heating of filaments to produce light. By 2030, I am confident that the majority of luminaires sold for building interior and immediate perimeter lighting, will be low voltage DC with integrated intelligent control. At that point, the demand for AC line voltage LEDs will be reduced to zero. As time has passed and my experience grown, I simply find nothing compelling about any light source that flickers, at any frequency under 2,000Hz, and then only if necessary to support dimming using PWM or PAM control. We can eliminate flicker now, let’s do it!